StressMarq is a company based in beautiful Victoria, British Columbia, Canada; and encompasses what is probably the most experienced combined commercial and scientific heat shock and cellular stress community worldwide. StressMarq is a new company that draws from the scientific excellence and history inherent in its scientific community, and aims to provide and serve that community with high value bioreagents in the stress-related fields. 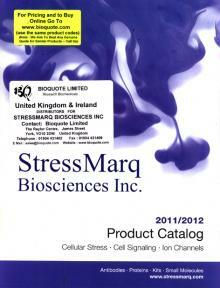 Drawing on two decades of experience in this sector, StressMarq embodies the following key elements which are aimed at providing the best possible research tools: scientific excellence, multiple product types (antibodies, proteins and kits for research purposes), and bridge products where the core competency of this company overlaps into cell signaling and other areas.